Paddington first charmed American audiences forty years ago. Now a new generation will surely be won over by Paddington’s particular brand of preposterous humor and gentle satire. The Browns first meet Paddington on a railway platform in London. He is sitting on a battered suitcase, wearing an odd-looking hat and a sign around his neck that reads, Please look after this bear. Thank you.” And that is just what they do, unaware that home will never be the same once Paddington becomes a member of the family. Mr. and Mrs. Brown first met Paddington--a most endearing bear from Darkest Peru--on a railway platform in London. A sign hanging around his neck said, "Please look after this bear. Thank you" So that is just what they did. I wrote my first children's book in 1957 and it came about largely by accident. At that time I had been a part-time writer for about ten years, following a common progression in those days: short stories, newspaper and magazine articles, radio plays, plus a few short plays for television, I thought it was a good year if I sold one piece in ten. Without giving the matter any great thought, I had always regarded writing for children as a lesser form of creativity-quite untrue, of course. As Gertrude Stein might have said-a book is a book is a book, and writing is perhaps even more of an agonizing process of distillation when it's for children. There being nothing more soul-destroying than staring at a blank sheet of paper hoping something will happen (it won't unless you make it), I was sitting at the typewriter one morning when my gaze happened to alight on a toy bear I had bought my wife for Christmas. 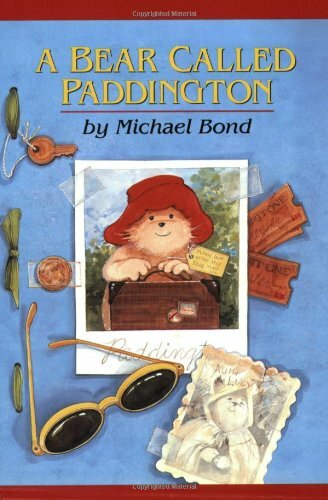 We called him Paddington, so I typed the words: "Mr and Mrs. Brown first met Paddington on a railway platform. In fact that was how he came to have such an unusual name for a bear, for Paddington was the name of the station." Suddenly, I wanted to write more about this small character. Where had he come from? What was he doing in London? What were his reactions to life in England and the curious complications we humans make for ourselves? Until that time I had always thought up stories and then tried to people them with characters. Suddenly, I learned a very simple fact of fictional life. If you create a believable character and you place it into a situation, events will develop naturally of their own accord. Many of my radio and television plays had been light comedies which more often than not were returned with the comment "Sorry-no call for fantasy" written across the rejection slip. Nonsense, of course: All works of fiction are fantasy, and nothing could be more so than the concept of a bear with a penchant for marmalade sandwiches, who lives in Notting Hill Gate and speaks perfectly good English. But until then, I hadn't learned the trick of making it seem believable. That won't happen unless both you, the writer, and the characters in the story believe in it, too. I wrote the first chapter very quickly, instinctively putting in all the things I felt I would have wanted as a child. More followed, and in ten days I had a finished book. In retrospect, some thirty-five years and many books later, I think most fictional characters who enjoy longevity do so because someone, somewhere, at some time wrote about them for the very simple reason that they wanted to. The first book of any series is the most fun to write; everything is fresh and exciting, and you can go anywhere your fancy takes you. Recapturing the original mood in subsequent books isn't always easy. Parameters have been set which dictate future stories; what the characters can and can't do. Paddington has the best of all worlds; he combines the naivet of a small child with the sophistication of an adult, plus ingredient "X"-his own peculiar brand of logic. Being a bear, he gets away with things without seeming precocious. The stories wouldn't work were he a small child. Children hate being written down to or made to feel they are being patronized. They like their heroes to come out on top and the feeling of comfort that goes with a safe return to base or the comfort of a home. They also-quite rightly-dislike being sold short. I hold the old-fashioned view that stories should have a beginning, a middle, and an end, and the hardest part with Paddington is not getting him into trouble-he does this of his own accord-but getting him out of it in a way which is morally justifiable; someone must always benefit from his misdeeds however tenuously. If fiction does nothing else, it provides a window on the world; perhaps showing things from a different viewpoint; even if-as in the case of another series I write about a guinea-pig called Olga da Polga-that window happens to be part of a hutch. I once received a letter from a child who said she liked my books because they made pictures in her head. It was the nicest compliment I've ever had.